The trend of gold is tremendous, since july 2011 gold has gained nearly $400/ounce and the raise in gold due to poor global macro economic conditions.Gold is resisting to close above $1900 levels on EOD basis. As bulls could not manage to hold the $1900 level yet again – this time forming a bearish double top pattern in the process. Gold EMA charts are shown along with 5EMA High-Low Buy or Sell indicator. 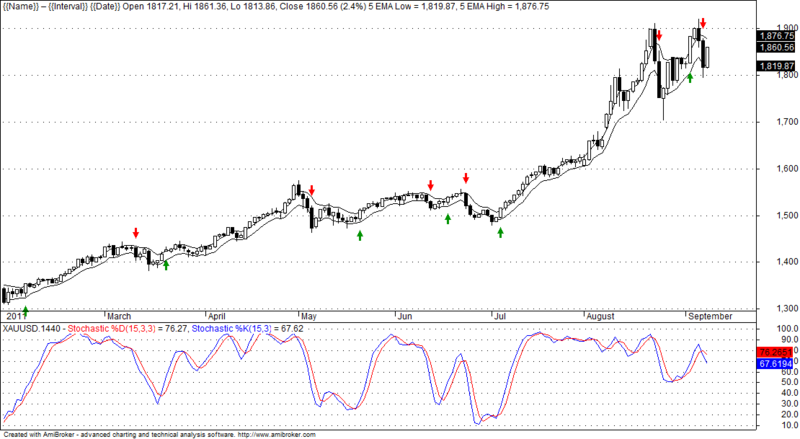 There is a recent sell signal on 7th September 2011 warning medium term trend reversal. Manage your risk. There is no doubt that gold has rewarded investors will great returns, however, no one ever went broke taking a profit. Taking a bit off of the table at current levels to lock in gains is a prudent idea. Should gold break above $1876(i.e Breaking above 5EMA) again on EOD basis, that would be a great time to reenter, as a push to $2000 would appear likely. At such high levels, the risk has transferred squarely to the bulls. Getting short a large position here with a minimum target price of $1700 leves with $1900 as EOD stop loss and a stop out above the all time high of $1923.70 provides for a fantastic risk/reward ratio. from where can i get free eod data for ami for gold and silver , tx in adv. Jitin check out the new Post done in market calls about cbloomnews realtime charting application. sir how to add 5EMA HIGH -LOW in META-4 PLATFORM . Can you help please.